U.S. President John F. Kennedy was assassinated 55 years ago 22 November. 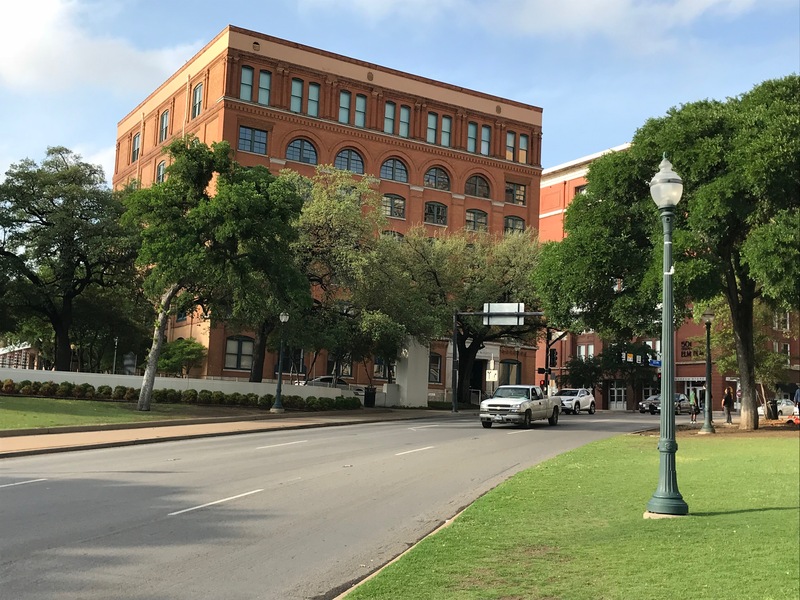 In May, I visited the scene of that historic crime, now The Sixth Floor Museum at Dealey Plaza in Dallas. The scene of the crime. Assassin shot from far right window, square, not arched. Sixth floor is one floor below top row of windows. A museum about any murder would be a sad place. This one is particularly depressing (though well designed), since it also represented a huge loss of American innocence and idealism. In my opinion, it also marked the end of an Irish-American century that began with massive immigration of the Great Famine. Peter Rice, an Army presidential helicopter pilot who accompanied Kennedy on the 1963 trip to Ireland. Rosian Zerner, who was in Dublin, Ireland, at the time of the assassination. Eamon Kennedy, an Ireland native and photographer at the Dallas Times Herald during the assassination. Dr. Peadar Cremin, who as a 14-year-old boy witnessed JFK in Ireland. Kennedy was flawed, I know, and it’s easy to slip into sentimentality about him. But my stop at the Dallas museum seemed inevitable and necessary, the completion of a history trail on both sides of the Atlantic. I have visited the Kennedy Homestead in County Wexford, where JFK made his triumphant June 1963 homecoming, five months before the murder, and seen the Kennedy tributes in Galway, his last stop in Ireland. I have been inside the Dáil Éireann chamber, where he gave a memorable speech. When I lived in Boston, I explored the JFK Presidential Library and Museum, but skipped the boyhood home tour. I have attended Mass at Holy Trinity, St. Stephen Martyr, and St. Matthew’s churches in Washington, D.C., where he worshiped in the Roman Catholic faith. Kennedy’s former presence is recognized at all three churches, most notably St. Matthew’s Cathedral, where a marble plaque is imposed in the floor in front of the sanctuary. This is the spot where Kennedy’s casket was stationed during his funeral Mass. Most movingly, I have stood at the eternal flame next JFK’s grave in Arlington National Cemetery. Now, too, the Philip Johnson-design cenotaph in Dallas. John F. Kennedy Memorial Plaza, Dallas. 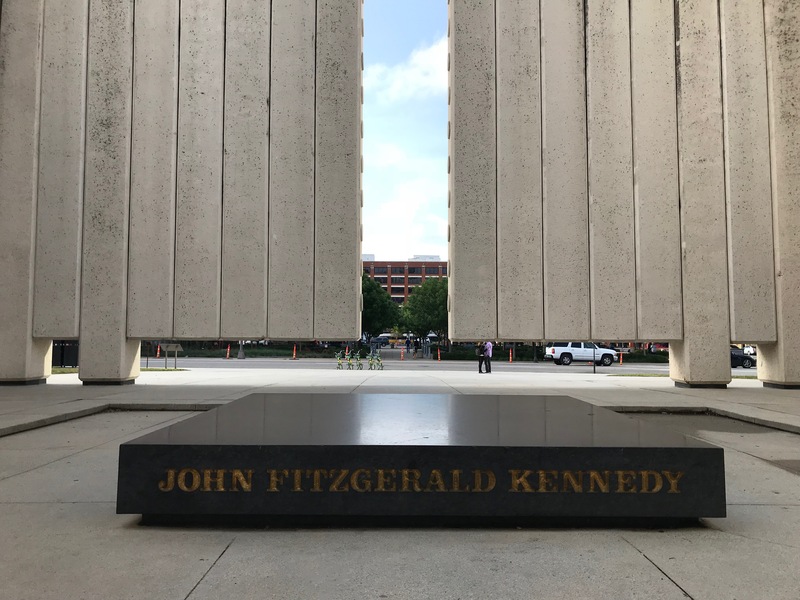 This entry was posted in History, Irish America and tagged Boston, County Wexford, Dallas, Galway, John F. Kennedy, Washington D.C. on November 21, 2018 by admin.